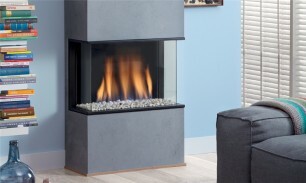 The new standard for gas fireplaces. 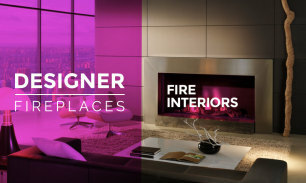 DRU offers various solutions so that you can afford the fireplace of your dreams. 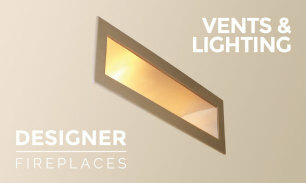 There are numerous interiors finishes for the fires including a brick effect to a chunchy beam effect. 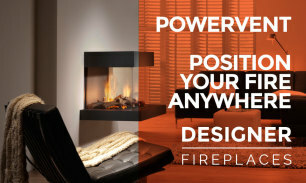 With the new DRU PowerVent® system you can now position your gas-fired stove pretty much anywhere. 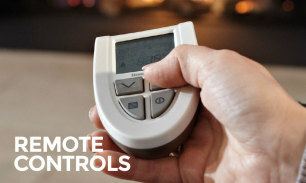 All our fire are controlled by remote control hand sets there are three different remotes depending on which fire you choice. 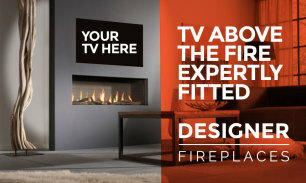 Who said your TV can not go above your fireplace, we have been designing and making chimney breasts with the TV and sound system above the fire for 10 years. To optimise the heat transfer from the fire and to facilitate cool chambers for the TV we used a range of Vents some of which have lighting elements that can be controlled from the fire remote control in the case of the Metro range. TV above the fireplace. Can it be done? 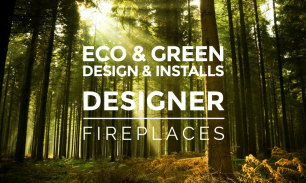 © Designer Fireplaces & FireplaceTV.co.uk Ltd. 2019.